Empire of Deception: The Incredible Story of a Master Swindler Who Seduced a City and Captivated the Nation (Algonquin Books / HarperCollins Canada). By Dean Jobb. Now available as Hard cover, paperback, and e-editions. 1. Tell us a bit about your book. Empire of Deception is the untold story of Leo Koretz, a master of the Ponzi scheme and one of the most brazen and successful con men in history. He was the Bernie Madoff of the 1920s and ran an elaborate swindle in Chicago that raked in as much as $400 million, in today’s terms. He claimed to control vast oilfields in Panama and was so successful that some investors begged him to take their money. Not even the exposure of Charles Ponzi’s infamous scam in 1920, which gave the rob-Peter-to-pay-Paul investment fraud its name, aroused their suspicions. Koretz’s grateful investors nicknamed their financial guru “Our Ponzi,” never suspecting – until the fraud was exposed in 1923 – that the joke was on them. It’s a story grounded in an era of wealth and glamour and a timeless tale of greed and gullibility. And Koretz’s story is inseparable from the crime and corruption of 1920s Chicago. Robert Crowe, the state’s attorney who brought Koretz to justice, was a controversial figure with underworld ties and, by coincidence, he and Koretz knew each other – they had worked together as young lawyers. Crowe’s lust for political power became a parallel story in the book, playing out as Koretz established and operated his massive fraud. 2. How did you come up with the idea for this work? When Koretz’s scheme collapsed, he fled to Nova Scotia, the Canadian province where I live. He took the name Lou Keyte, posed as a wealthy literary critic and lived like a king on his ill-gotten gains. While researching another subject in the provincial archives, I stumbled on a reference to his arrest in 1924 in Halifax, the Nova Scotia capital. I had never heard of Koretz, and soon learned that little had been written about him. I knew it was a great story and I was determined to find out everything I could about this charming, flamboyant character. My research turned up a wealth of material on Koretz and his scam in court files and archives in the United States and Canada. I also discovered the first-hand accounts of some of his associates and victims. The most valuable sources, however, were newspaper accounts of the fraud and the year-long manhunt for the fugitive swindler. Chicago boasted six daily newspapers in the 1920s, and their extensive coverage provided the detail I needed to recreate the story of Koretz’s scam and his times. This is the stranger-than-fiction story of a larger-than-life character, which made this book a joy to research and write. The challenge was to do justice to the material. Narrative nonfiction should bring people and events to life, transporting the reader to another time and place. The celebrated American author David McCullough, a master of narrative history, encourages writers to “marinate” their heads in a time and a culture so they can produce engaging, vivid accounts of lost worlds. He’s right. I thoroughly researched every aspect of the story and read as many books, memoirs and historical records as possible that touched on the subject and the era. What was the most exciting/surprising thing you learned? My most amazing discovery was that Koretz acted alone. He didn’t have a company or a sales force to attract investors, like Charles Ponzi did. He operated in secret and didn’t have a high profile in the investment world, like Bernie Madoff did. Koretz created a make-believe world of phantom oil fields and fake profits, and fooled everybody he dealt with, even his closest friends and family, for the better part of 20 years. And he did it all single-handedly. It was a remarkable accomplishment. I’m researching a new true-crime book for Algonquin Books and HarperCollins Canada, the publishers of Empire of Deception, with the working title The Case of the Murderous Doctor Cream. It chronicles the crimes of Thomas Neill Cream, a Canadian doctor who was one of the world’s first serial killers. He murdered at least nine people in Ontario, the United States and Britain in a rampage that eclipsed the notorious crimes of his Victorian-era contemporary, Jack the Ripper. The press dubbed Cream “The Lambeth Poisoner,” after the London neighborhood where he poisoned four of his victims. This dark tale of murder and madness will be told in tandem with Arthur Conan Doyle’s creation of Sherlock Holmes, the iconic sleuth who transformed crime fiction. As Doyle’s creation solved crimes on the page, police forces on two continents struggled to link a string of seemingly random killings to a single, mysterious suspect. Separate Beds is an excellent academic treatment of the system of Indian Hospitals set up in Canada. Dr. Lux says from the outset that she is focusing on understanding the government bureaucracy through the documentary record, but still balances this well with some oral histories from Indigenous Elders, leaders and former patients of the hospitals. In particular, I found her exploration of the Blackfoot and Blood hospitals in southern Alberta really showed the hypocrisy and paradoxes inherent in government policy at the time – as well as the medical pluralism (traditional and biomedical) that occurred in these institutions. The Hobbema (Mascwacis) and Battleford examples in particular demonstrated how Indigenous communities fought for access to health care – a treaty right – on their own terms, especially in the face of discrimination in community hospitals. Finally, Lux shows convincingly that government and medical bureaucrats were often motivated by prejudice, avarice, and their own self interest, even as they cloaked their work in humanitarianism. 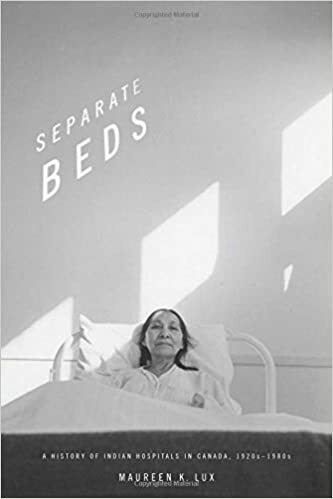 Separate Beds is an essential companion book to James Daschuk’s Clearing the Plains and Ian Mosby’s work on nutritional experiments on reserves and in residential schools. It shows so many of the root causes of health disparities between Indigenous communities and the rest of Canada, and how Canadians have benefited not just from the signing of the treaties, but through the medical cost savings the government squeezed out of Indigenous peoples. While Canadians are incredibly proud of our Medicare system and count it as a defining feature of our identity, it was in large part funded by the creation of a parallel system that penalized and underserved Indigenous individuals and communities. I read In This Together, and wow. There were stories in there that I connected with emotionally, stories in there where I could relate to what the author was saying, and stories that made me question myself. All the stories made me think. Thank you for this book. I honestly believe that it needs to be read by all High School and University students.